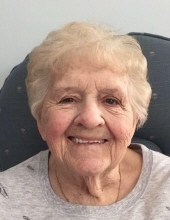 Joan Barbara Shubitowski, a resident of the Milford area for over sixty years, died at Huron Valley Sinai Hospital on October 22, 2018 at the age of 86. Born August 7, 1932, Joan was the youngest of three children born to parents George and Ethel Lockwood. Having recently immigrated to Michigan from England via Canada, Joan and her older brothers, Desmond and Kenneth, were raised in the Detroit community. Joan married the love of her life, Bernard Joseph “Bernie” Shubitowski, on May 25, 1948, and in 1958 they moved their growing family to Milford and joined St. Mary’s Catholic Church. They raised their six children there on somewhat of a ‘gentleman’s farm’ where they enjoyed a variety of animals, including cows, rabbits, pigs and other animals, along with helping in their family’s large garden from which Joan canned tomatoes and various vegetables and made pies from the apples they picked from the trees. Joan’s pies, especially her lemon meringue pie, were always a treat. She and Bernie donated their extra produce to the Community Sharing program in Highland. Joan was an amazing hostess at her home and was always prepared to entertain family and friends with homemade goodies. She loved her kids and grandkids and great grandkids and taught them the joys of singing, being good to one another, spending Sundays together, and the importance of family camping trips which they enjoyed throughout the years on Higgins Lake, Lake Tyrone and various other locations that were near water and where she could teach the children how to ski. She was mischievous, fun, and an amazing wife, mother and grandmother who will always be remembered for the love she brought to her family. She was preceded in death by her beloved husband of nearly seventy years, Bernie, in March of this year, and is survived by their children: Donna (Andy) Lovrin, Janet (Dan) Shubitowski, Thomas (Renia) Shubitowski, Nancy (Chuck) Snider, Jill (Mike) McDiarmid and Jack (Romy) Shubitowski; thirteen grandchildren, Amy, Heidi, Ann, Andrea, David, James, Brian, Reed, Andy, Kathryn, Tyler, Eric, Jamie; seven great-grandchildren; brother, Kenneth (Claire) Lockwood, sister-in-law, Carol Shubitowski, and a host of extended family and friends who join in mourning her passing and giving thanks to God for her life among them. Joan was preceded in death by her brother, Desmond (Violet) Lockwood. Mass of the Resurrection will be held at St. Mary Our Lady of the Snows, 1955 E. Commerce, Milford on Friday, October 26th, 2018 at 11 AM with gathering to begin the hour prior at 10 AM. The Rev. Msgr. John Budde to officiate. Memorial contributions may be made in Joan’s memory to: the Carl’s Family YMCA (towards youth programming), St. Jude Children’s Research Hospital or to her church. For further information, phone Lynch & Sons, Milford at 248.684.6645. "Email Address" would like to share the life celebration of Joan B. Shubitowski. Click on the "link" to go to share a favorite memory or leave a condolence message for the family.